Each box is curated around a specific theme. The theme of the July 2016 Play! 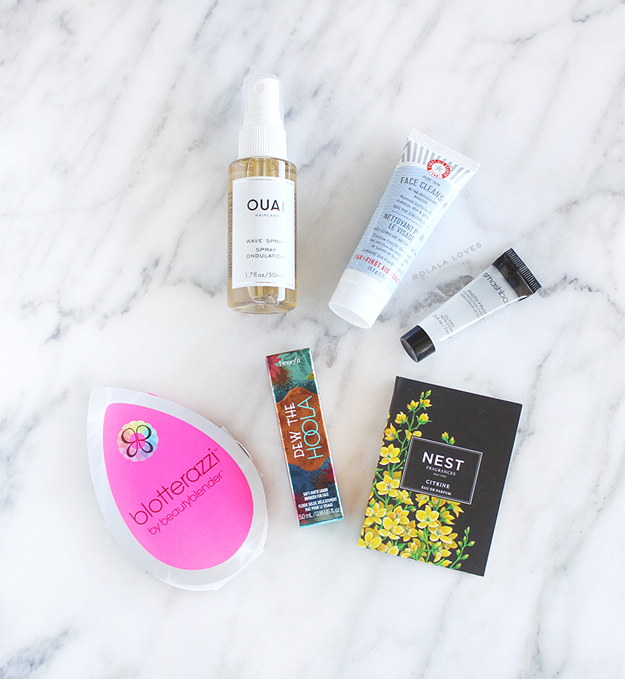 by Sephora Box is Effortless Summer. How timely! The products are a selection of warm weather essentials and sunny standouts to keep one chic all summer long. If I'm not mistaken, this is the first time there are two versions of the box based on skin type. I received the one for dry skin. 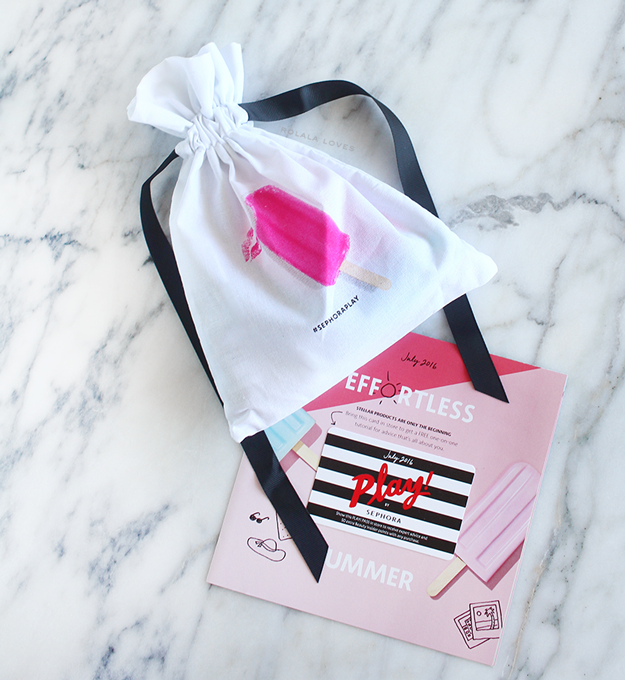 The popsicle design on this month's pouch is so cute! 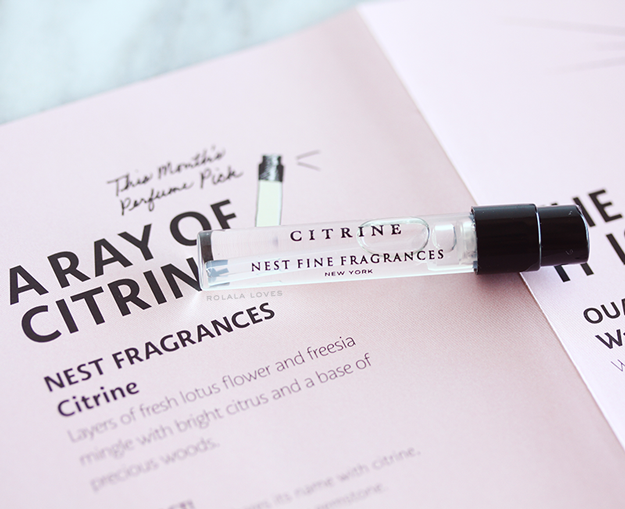 Nest Fragrances Citrine :: Layers of fresh lotus flower and freesia mingle with bright citrus and a base of precious woods. This fragrance has notes of lemon blossom, lotus flower, freesia, dew drop accord and precious woods. A rollerball of this fragrance retails for $25 while the full size spray is $68. I've never been a big fan of the scent of freesia so I had a feeling I wouldn't like this scent and I don't care for it at all. I didn't detect any citrus at all and it's really more of a heady floral which I found overpowering. This probably would be nicer if the bright citrus was stronger to tone down the heavy sweetness. Well I know to stay away from this scent now. 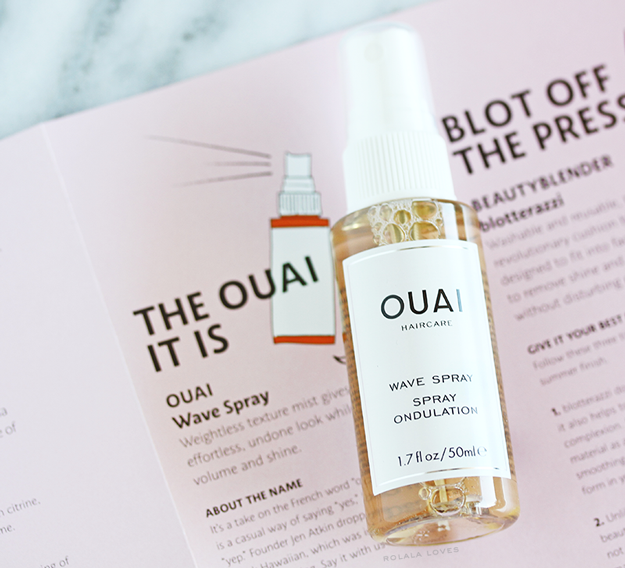 Ouai Wave Spray :: A weightless texture mist that gives hair an effortlessly chic, undone look. It is infused with a specialty rice protein that protects hair fibers from the inside against oxidative damage due to solar radiation. This feather-light spray imparts natural wave and body without any dryness or crunch. The full size product retails for $26. Despite being Asian, I don't have the prototypical straight Asian hair that behaves. My hair is typically thick with a fair amount of wave which I seem to be in a constant battle with. Sometimes I just give in especially when it's hot and humid and I don't really want to heat style it. I could see this product being used as a texturizer or volumizer. I'm interested in playing with this spray to see what it can do. 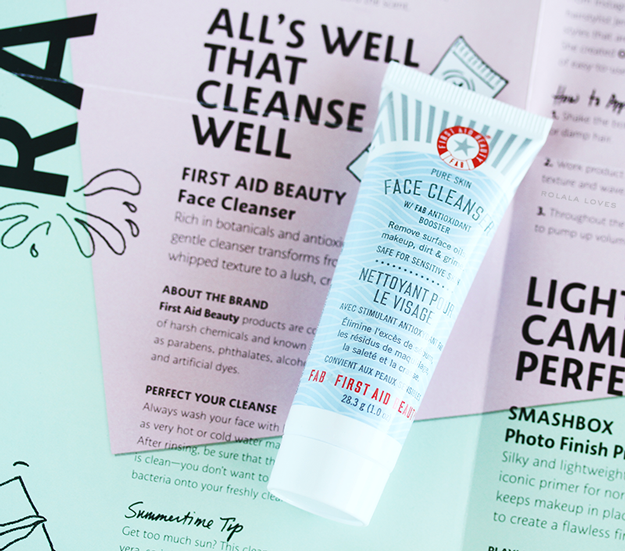 First Aid Beauty Face Cleanser :: A fragrance-free cleanser that gently cleanses the skin, removing surface oils, makeup, dirt, and grime with a whipped texture that transforms into a rich cream when blended with water. It is infused with a powerful botanical antioxidant blend that works hard to help block damaging free radicals. It helps calm redness and is pH balanced to maintain the natural acidity of the skin. Daily use will result in fewer flare ups and reduced skin reactivity. that effectively removes makeup, dirt, and grime, leaving skin soft and supple. This product is available in a number of sizes and retails for $5 to $30. Low pH cleansers are my jam. If your foaming cleansers are drying out your skin, the likely reason is because the pH is too high. I feel like I actually have tried a sample of this before and it was decent. Well if it lives up to it's claims, it would make an ideal second cleanser for night use. 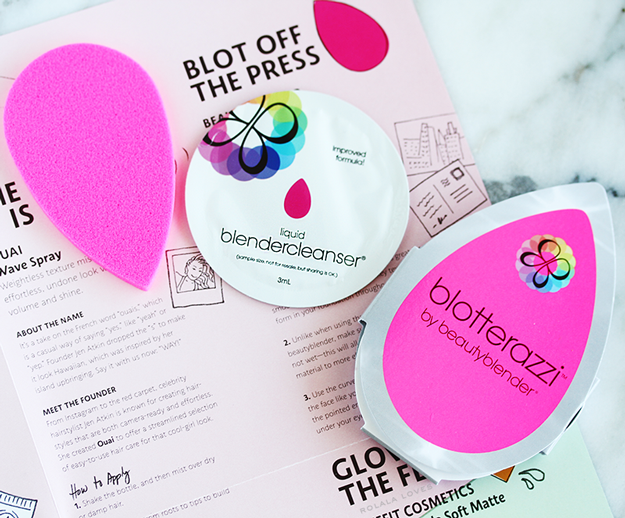 BeautyBlender Blotterazzi :: Shaped to fit all contours of the face, the blotterazzi saves you from unused corners like traditional blotting papers. Made with the award-winning beautyblender material, these blotting sponges remain “thirsty” when they are dry, absorbing excess oil without disturbing makeup so that skin stays looking radiant. The full size product comes with two sponges and retails for $20. I've heard of this product and it intrigues me since blotting papers are a must have item in my purse. I actually make use of my entire blotting sheet when I use them so I don't know about those unused corners they're talking about. I guess this is more eco-friendly since it's reusable and washable but that seems like it could be tedious and less hygienic as well since blotting papers are one time use. 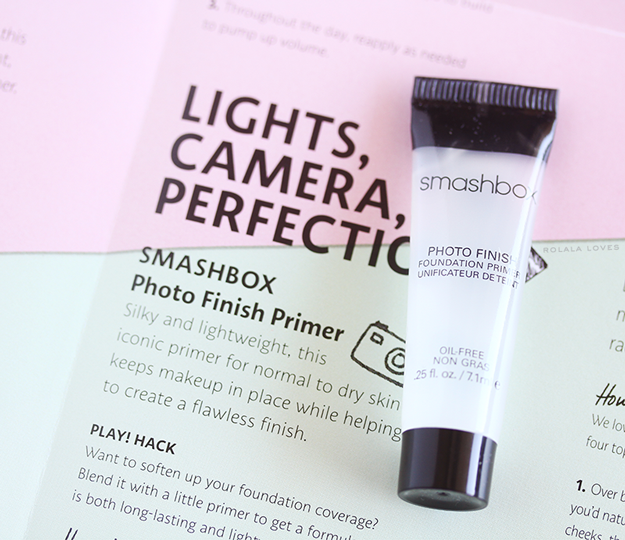 Smashbox Photo Finish Primer :: An iconic primer for normal to dry skin with a silky blend of vitamins and antioxidants that smooths and perfects skin, while the unique formula supports natural collagen and fills in fine lines and pores to keep makeup in place while creating a flawless finish. This product comes in three sizes which range in price from $16 - $49. I feel like I've tried a sample of this particular primer at some point and it was okay. I tend to prefer non-silicone primers and this does contain some so I probably won't reach for it as much but the size of this product makes it ideal for travel. 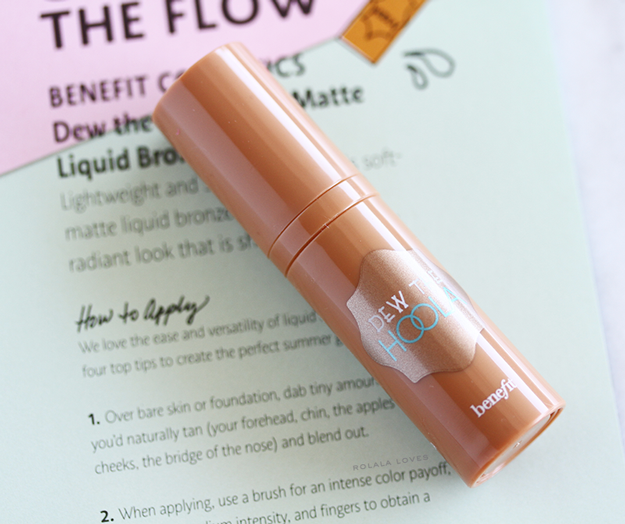 Benefit Cosmetics Dew the Hoola Soft Matte Liquid Bronzer :: This soft matte bronzer is a liquid version of the bestselling Benefit Hoola Bronzing Powder. The universal shade works on any skin tone and is supposed to give your face the most believable bronze. The smoothing effects and lightweight, buildable texture can be applied on bare skin or over foundation for a shimmerless, sunkissed glow. The full size product retails for $28. I tend to be wary of products that supposedly work on all skin tones but the idea of this this being a bronzer with a matte finish sounds appealing to me. I swatched it on my arm and the product comes out really orange but blends out to a wearable bronze and it feels very light. I liked last month's Play! by Sephora Box better but I was still satisfied with this box overall. It had an interesting mix of season appropriate products and I will probably put most of them to use except for the fragrance which I already tossed. At just $10, the value of this box can't be beat. The theme of next month's box is The Eye Openers which sounds promising already. Sephora gives you a little video peek at the month ahead and they also provide monthly Unboxing Videos where you can learn more about the products themselves as well as how to use them. You can sign up for Play! by Sephora online here. You can also learn more about the subscription by visiting their FAQ page. Win a set of all natural Ice Cream Flavor Lip Scrubs! Enter giveaway here! I have been meaning to try First Aid skincare ad Ouai, so this box would have been great for me I guess. So many great goodies in this bag. I wish Sephora makes this available in Canada soon. I think it's reasonably priced, and the selection seems to be fairly good:) Out of all the products, I really want to try that cleanser just coz I've never tried anything from that brand. PS Rowena, I am liking W! I really really love Han Hyo Joo...she kinda reminds me of SHK. But OMG...sorry to write this but am not liking Lee Jong Suk so far:( Aside from his crying scene, he basically has the same expression: >.< I really like the story though, so will watch the whole thing. I think I'll also be watching Uncontrollably Fond. Woo Bin is cute:D Are you watching that? Such a good box this month!! I want this one. I can't wait till Sephora Play! comes to Canada, I will definitely be first in line to sub! I dislike that Smashbox primer and I kept getting it in my beauty boxes, three so far and I traded two away. It makes my face look matte and super flat. Great review, Rowena. I am not a fan of freesia scent either, so it's a pass for me too. Happy new week, girl. I'm in love with that popsicle pouch Rowena! That's so cute & is befitting for Summer. I must say Play! by Sephora is much better than when it started out. I've been very curious about Ouai hair care products. Ive been wondering what that Bloterazzi thing was all about!?! I don't know? A sponge vs blotting papers? I love the blotting papers you sent me. Sponges just don't seem sanitary. I didn't like Benefit's Dew The Hoola. Was too orange on me. LOL I've been curious about NEST fragrances. I don't like strong scents either. LOL Oh well, let's hope better for the next box. Wishing you a lovely week. I can't get over how impressive this Sephora subscription box (I loved last month's review too) - such a fab range of products (especially Benefit's liquid bronzer). I'm also swooning over the lollipop pouch - it's so sweet! You are right they do a great job with their box from content to presentation. I bet you are tempted to the full size on everything hahaha. What an awesome box and such great products. I think it is a good idea to use samples then buy full size. I never knew about this! But it sounds awesome! Looks like some lovely products! Looks like a legit-amazing subscription thingy. I like that you can tailor it to your needs, rather than getting randoms that are no good. I doubt it'll come to Oz anytime soon, but if it does I might look into it. What a cool box to have! As if Sephora have a beauty box now! Amazing, I'm so jealous we don't have it here! Great products. I love that Smash Box primer. I wish they included more makeup products. Oh my goodness! I can't believe I didn't know about this box! The low price shocked me considering Sephora carries all high end brands. Love the items you received!